My Favorite Magazines and Are Subscriptions Worth It? I am a self-proclaimed magazine hoarder. I have issues from years back and I don't want to part with them. If I see someone on the cover that I like, I'll buy it. I'm all about impulse buys and living in the moment. In my armoire I have an entire shelf dedicated to all of my magazines organized by date (for the most part) and separated into each magazine. 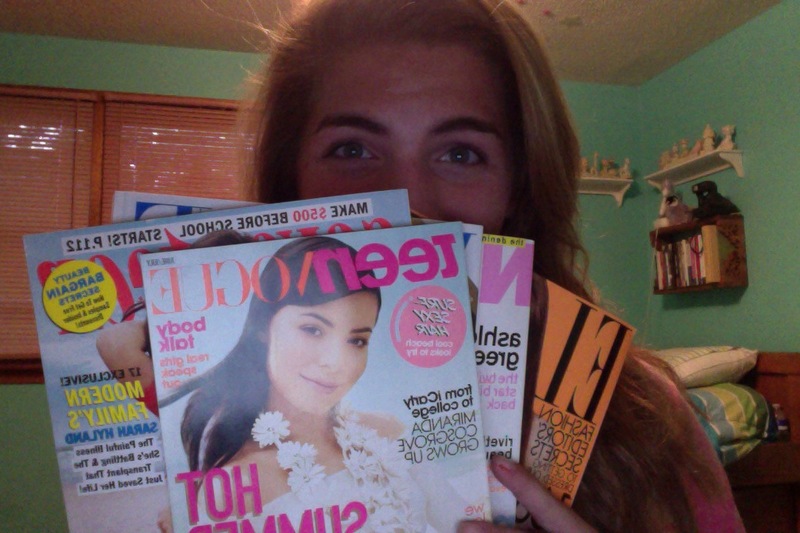 I have duplicates of these magazines: Teen Vogue, Seventeen, Nylon, Vogue, Elle, Marie Clare, and Glamour. I'm more into the fashion magazines and avoid gossip magazines like a plague (though I do have three issues of people---One dedicated to Selena Gomez & Demi Lovato, another to the Jonas Brothers and the last contained pictures from Kevin and Danielle's wedding). 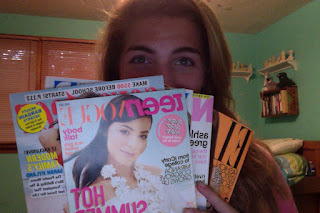 My favorite by far is Seventeen magazine, mostly because it is geared more toward people my age. I like the helpful hints and fun articles in it---it keeps me young! My second favorite is Teen Vogue. I love the photoshoots in this magazine particularly but sometimes I feel a little sad that I can't afford most of the stuff in it. But that's the point---it's a mini Vogue! Nylon has by far my favorite photographs. They're more out there and sort of artsy with the hair and makeup, which totally reels me in. I'll usually only buy Vogue, Elle, Marie Clare, etc. when there's someone on the cover that I really, really love or when I'm itching for a new magazine to read. Now onto the big question: Are magazine subscriptions worth it? My answer with forever be yes, but with caution. I pay for my Seventeen subscription with my own money because that's how much I love that magazine. The articles, the content, everything about it caters to things around my age so it's a perfect fit for me. I also have a subscription to Teen Vogue and Nylon but those two were gifts and I probably wouldn't be subscribed to either if I had to pay with my own money. It truly depends on your interests. Personally, I wouldn't subscribe to People magazine or OK! Magazine because celebrity gossip doesn't interest me. But if you love that kind of stuff, then go for it! I'm not subscribed to Tigerbeat or J-14 because I've outgrown that kind of stuff but if you're a younger teenager or are interested in pop culture like that then subscribe or ask for it as a gift. Sometimes I forget to go out and pick things up so a subscription is a reminder of a new month and makes it easier for me to get ahold of the magazines rather than going out and spending 3-5 dollars on a new magazine. You do save money with subscriptions but if you're not totally into the magazine that money is just going down the drain.